Grouted surfaces, such as tiled floors can be breeding grounds for mold, bacteria and ultimately odors if not properly cleaned. Without a proper maintenance program, this build-up can collect in grout lines. Grout is very porous so in addition to general soil buildup, bacteria causing soils such as urine in restrooms, animal fats and proteins in kitchens and body oils in showers are able to penetrate the surface and become embedded. This not only makes future cleaning and odor control more challenging, but can permanently discolor the grout and create a poor perception of clean in the facility. Traditionally, the lighter the grout color, the more challenging it is to keep it clean. All tile and grout must be cleaned on a regular scheduled basis in order to insure that it is clean and free from bacteria. Using a three prong approach to insuring proper maintenance has proven to be the most effective way to maintain grouted tile floors. Conduct a deep restoration procedure using the proper tools and procedure to return the grout and tile surface back to its original new-floor condition. HEAVY-DUTY formulation removes ground-in grime, soap scum, body oils and mildew. Technology provides for incredible cleaning power on both sides of the pH scale, simplifying the process of cleaning tile & grout on floors and walls in restrooms, showers, kitchens and wherever grout and tile require heavy-duty cleaning power. Ideal for ceramic, quarry, brick pavers, slate and granite. Non-fuming, easy-to-use formula. Concentrated cleaning power. Product also contains malodor counteractant formulated to tackle tough restroom odors. Item #324044 gl/cs 4/cs. 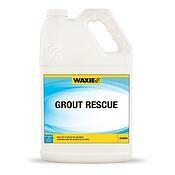 View the WAXIE Grout Rescue Product Brochure. Once the floor is restored, a protective barrier is an excellent option to help insure that soil and bacteria will not penetrate the grout, making maintenance easier and more cost effective. WAXIE provides several options for your grout and tile protection; from impregnators, to acrylic topicals, to semi-permanent coatings. A tough, permanent, high solid, water-borne sealer that penetrates deep into grout and repels soil and germs while improving slip resistance. This protection will dramatically reduce maintenance costs, due to the ease of cleaning. Dual cross-linking polymer makes this seal ultra-durable against wear and soil and bacteria penetration. Highly resistant to acids, bases, and stains. High solids formula fills pores in grouted surfaces. Very low odor and meets or exceeds VOC regulations in all 50 states. Improves traction on floor to decrease slips and falls. Item #931184 gl/cs 4/cs. View the WAXIE Grout Guard Product Brochure. Single component, topical seal, builds to bring out the brilliance in tile and stone floor surfaces while protecting them against harmful wear and tear. Applies using traditional finish mops as well as flat mop systems. It levels easily, bonds to the surface to provide proper adhesion, and dries fast. Improves traction on the floor to reduce slip and fall potential. WAXIE Grout & Tile Seal can also be applied on top of WAXIE Grout Guard penetrating grout seal for added protection. Very low odor and meets or exceed VOC regulations in all 50 states.Coverage: Up to 2,500 Sq. Ft. per gallon. 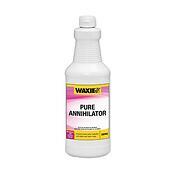 Can be removed with conventional floor stripping solutions such as WAXIE Pure Annihilator (320940). Item #931194 gl/cs 4/cs. 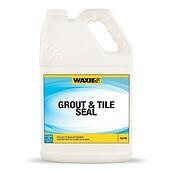 View the WAXIE Grout & Tile Seal Product Brochure. Regular scheduled cleaning, using the proper products and procedures designed for grouted tile surfaces, is the key to keeping soil and bacteria from building up on grouted surfaces. Cleans and maintains grouted tile surfaces without dulling the tiles’ natural shine. It’s concentrated formula provides dilution ratios ranging from 1 ounce per gallon of water for daily soil removal, to 8 ounces per gallon of water for heavy-duty soil removal. WAXIE Grout & Tile Maintainer ’s unique formulation fights back soil and hard water buildup making it the perfect solution for daily cleaning of finished and unfinished tiled surfaces. Fresh clean fragrance. Item #324054 gl/cs 4/cs. 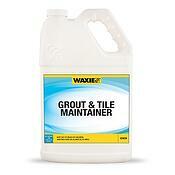 View the WAXIE Grout & Tile Maintainer Product Brochure. Traditionally, the lighter the grout color, the more challenging it is to keep it clean. All tile and grout must be cleaned on a regular scheduled basis in order to insure that it is clean and free from bacteria. Using a three prong approach to insuring proper maintenance has proven to be the most effective way to maintain grouted tile floors. View the Total Grouted Tile Maintenance System Brochure. Tiles can crack or get scuffs over time. Yet the majority of grime and bacteria-filled debris actually ends up on top of and inside the porous grout itself. While it can start as a less visible problem, grout care maintenance ensures that you don't face problems like tile movement and mold infestations over time. But how do you get on track? What If I'm Not Quite There Yet? Okay, How Do I Keep My Floors Looking Good? With a solid foundation of cleaning and sealant applied, then regular grout care maintenance is pretty easy, especially with the formulations like those found in the Grout & Tile Maintainer. You dilute it based on the traffic each area of flooring receives as well as the amount of dirt buildup you see. You're not alone if you need help keeping your floors clean for your staff and customers. 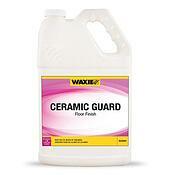 WAXIE products are designed to be adjustable for your grout care maintenance situation. Whether you want to start with stripping and re-sealing or take advantage of our Maintainer solution, we're happy to find you the right package for your needs. Fill out the short contact form to your right or call us toll-free at (800) 995-4466. With facilities throughout the Western U.S., WAXIE is here to help you with your floor maintenance needs from tile to grout and more, going above and beyond to deliver on time, on budget and with minimal hassle.